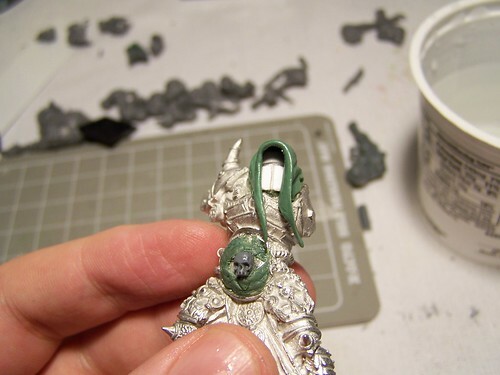 When last we looked at my custom daemon prince, I had redone his head and a few details here and there. It doesn’t look too bad, after some post-curing slicing and dicing. The nice part about Green Stuff is that it’s practically a carving medium after it cures. You could even carve details into it, if you were good at that sort of thing – I’m probably not. So, here’s a shot of the fronts, where I used the Scibor bits. Again, Scibor is a great sculptor who does great bits. The details on the leg armor are generic enough that it works for a daemon prince just as well as a Space Marine Captain. Next up were his arms and weapons. I liked the swords at first glance, and I thought I would just keep them. In all the time since I started this project, I decided they didn’t quite have the right look. A jeweler’s saw does the trick – a clean cut without losing a lot of metal. The arms came out really nicely, and a little Green Stuff will add details, like the top and bottom of his fists. Then, I pinned and glued the arms onto him. What’s great is that I’ve kept the cleft feet under the bulkier leg armor, and that his left arm will look fine without a weapon in it. My next step is to find the right combination of bits and whatnots to give him a cool polearm or staff that he’s holding in his right arm, angled down towards his feet (so that it all fits nicely on a 40mm base). Then I add some wings to him and he’s all done! We’re Back for Round 3! Moving is done. Kinda. I mean, the basement is a shambles, but I have cleared and moved enough that I can work on minis again, and play games again! Here’s where I picked up! This is Tharsis the Grim (Tharsis being a big plateau on Mars). Tharsis is the Captain of the Second Company of my homebrew Space Marine Chapter, the Basilicans. I would describe Tharsis as dour and thorough. Tharsis likes firepower. 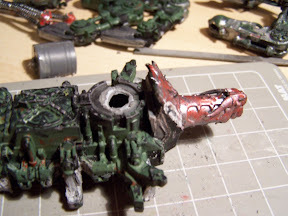 Wait till you see his signature land raider. Ah, Tharsis the Grim has the iconography of the Grim Reaper. Clever. 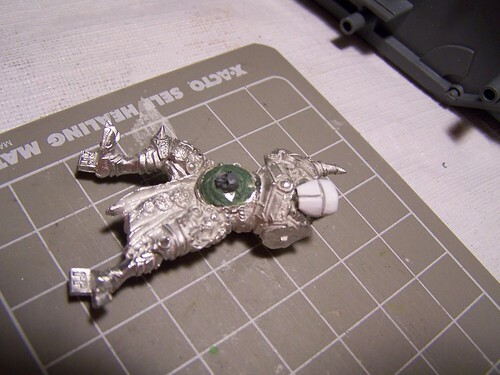 So this is a great miniature, Scibor is a great sculptor, he runs a great web site full of great things, and this is all great. Two problems – first, possibly because I cleaned too aggressively, the left hand isn’t flush against the wrist. There’s a huge gap. Second, the hammer, which I drilled out and pinned, of course, doesn’t line up too well with the pole that the hand is holding. Actually, I pin everything, including the hand to wrist and arm to shoulder in this miniature. Green stuff to the rescue! Continue reading We’re Back for Round 3! 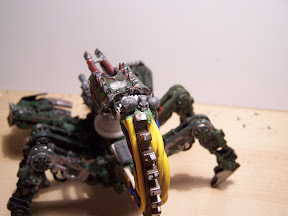 Another progress report on the Defiler! Here’re some detail shots. You can see the skulls I arrayed on the tail. I put the skulls there to cover up where the wires terminate a bit. Next is a detail shot of the box at the base of the tail. 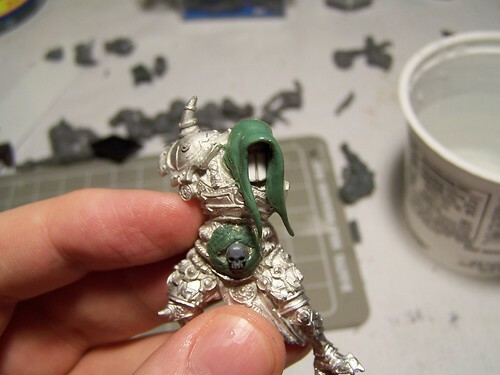 My Green Stuff sculpting hopefully looks fleshy. I ran the wires from the front into the box as well. And below is a closeup of some work on the leg joints. Green Stuff helps holds the whole thing together and it gives the look of daemonflesh growing on the Defiler… hopefully. The second picture is a shot of the front claws. 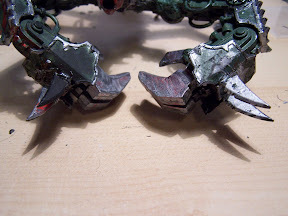 This is a fun picture because the blades on the back of the claws are very thin, but they were still pinnable. A little bit of glue would probably not hold those on for long, but a pin will hold them on for a very long time. The box ended up looking odd to me. Its square-ness didn’t seem to blend with the shape of the model, so I decided to give it detail that would blend its shape into the main chassis. In the shot below, you can see I added some pipes to the box. Later, Green Stuff would complete the “blending” of the box into the chassis. 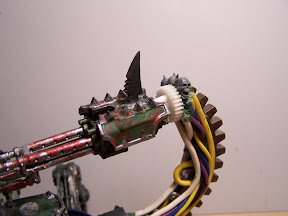 Next is another shot of the tail with skulls, this time with a blade! The blade was broken off the leg, and it was the only leg-blade left, so I saw no purpose in putting it back on a leg. Also, two of the armor plates that go on the leg are missing, so I gave up on those, too. 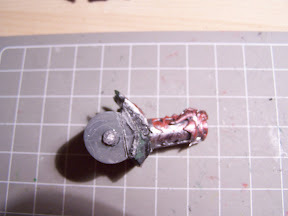 So, I pinned a blade onto the gun mount and it looks pretty cool. And below, finally, are two shots of the finished Defiler. Of course, I have to file off some seams and make sure holes are covered, and after the first coat of primer, I am probably going to have to go back and clean up some more (especially where there’s detail lost in the piles of paint and primer), but it is (basically) the final construction. 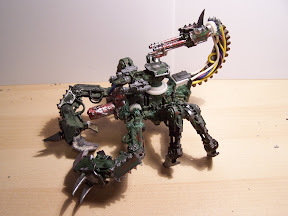 The Defiler /slash/ Brass Scorpion is complete, sculpting-wise! I’ll break up the last final steps into two or three posts. Now, the scorpion tail. First, I added the “skeleton” if you will. As you can imagine, there were several pins used – a few pin-sized pins and at least one nail. In this picture, I’ve attached the skeleton and (temporarily) stuck the autocannon “stinger” on to check out the spacing and positioning. Notice that the tail is also a gear-looking thing. This bit is from a Mad Hatter toy from American McGee’s “Alice” video game. So, if the video game came out in October of 2000, you can imagine I’ve had this for a long time. It broke off the toy at some point. I liked the look of it, so I kept it when I tossed the rest of the toy. 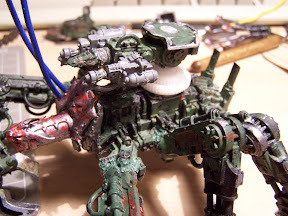 This was about 8 years before I ever considered modelling minis. Really, in a philosophical way, most of my life has been about collecting bitz. I just didn’t know it. This was easy – grab a big wire (from an old stereo – everything is bitz! 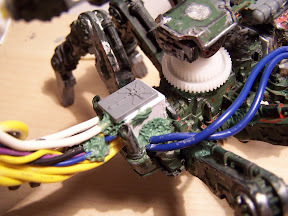 ), superglue the Hell out of everything, then place the wire. Repeat. I used different size wires and twisted them over each other in places to create a nice bundled look. Visually, just a few wires looks like a whole lot of wires – I used about 12 lengths of wire total. It looks like a lot more, and the twisting of the wires misleads the eyes and makes it look a lot more complicated than it is. You’ll notice in this picture I’ve used plasticard to start a box at the base of the tail. 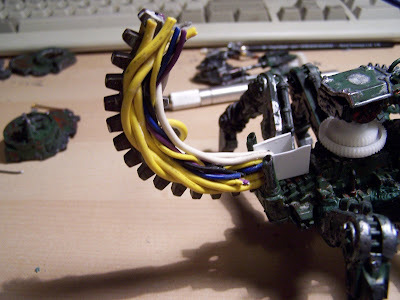 Some bulk was necessary there – otherwise, the wires would just kind of end. I figured I’d make it look like they all went into a sort of switchbox. Blurry again, but you get the idea. You can kinda see here that I finished the “switchbox” at the base of the tail. The tip, where the autocannons attach, still looks wrong in this picture. The two blue wires are still hanging loose, but I soon decided to connect them to the switchbox as well. So, the biggest part of things is done. In the next post, I add the finishing touches! 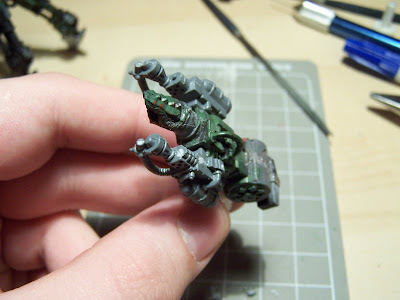 Here’s a short progress update on my Brass Scorpion style Defiler conversion! I apologize for the blurry pictures – I wasn’t paying attention to quality when I was taking them. So, my next step was to tear it all apart. This may have been a mistake. 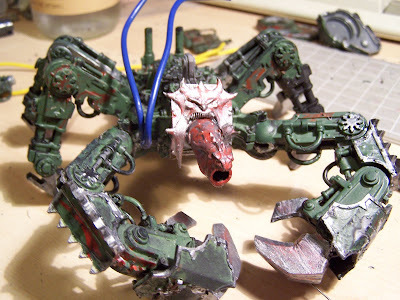 The legs on a Defiler don’t pose – they’re molded at that angle. 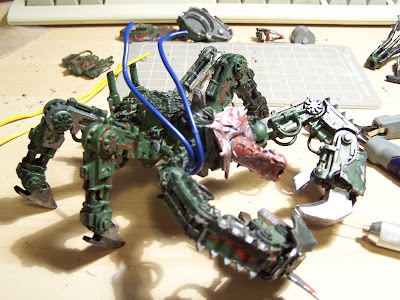 (The front claws can be set at different angles.) 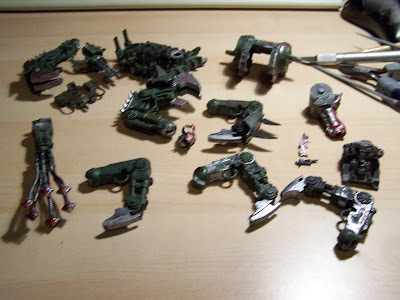 Tearing them off the body left a lot of damage, and in the end, I stuck them back on in almost exactly the same way. I should have left the legs on. Usually I’m good at knowing what to keep and what to trash, but not this time! I pinned the battle cannon to the body. Let me emphasize this – pinning is great. I’ll do an article on pinning sometime. Pinning not only gives you a nice gluing target, but it also helps prevent any shearing forces from breaking the bond. Force applied parallel to the seam, a shearing force, is the one that will pull your models apart most easily. 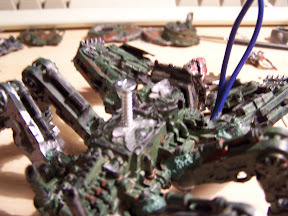 Pinning is a pound of prevention, and way more fun than trying to glue finished, painted models back together. So, then I put the model back together. This is when I realized taking the legs off was pointless. Defiler Dumpty is all back together again. 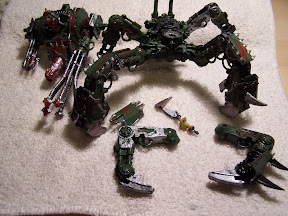 The front claws did have to be reposed to make them parallel to the ground to make the whole thing more scorpion-esque. 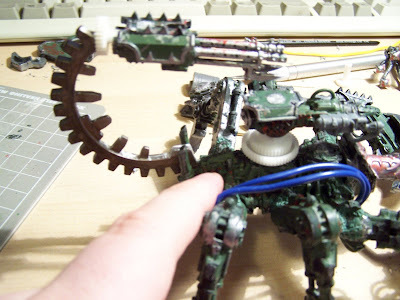 The front right claw was posed to touch the ground so it keeps the thing standing. Admittedly, the claws are not in an action pose, but I’m hoping to make the model more interesting in details than pose. 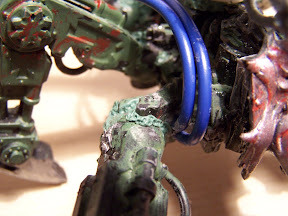 The two blue wires are covering up a hole I made in the front when I pulled him apart. The wires serve as a great detail item, especially in my vision for the finished product. I’m hoping for lots of gears and wires to make the thing look very malignantly mechanical. 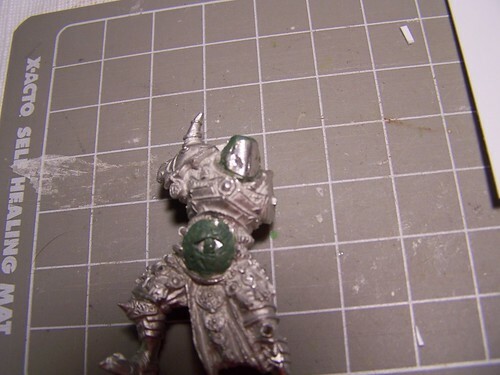 I’ll cover up the remaining flaws with green stuff to replicate daemonflesh. 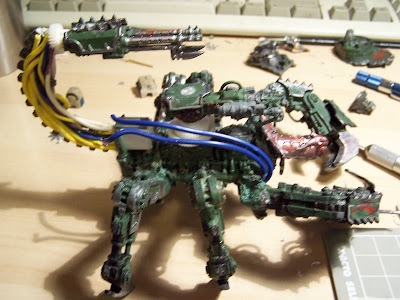 So… I bought a Chaos Defiler from ebay about two weeks ago. I wanted to make a scorpion-style Defiler (that could possibly double as a Brass Scorpion), but I didn’t want to do it from a fresh kit. 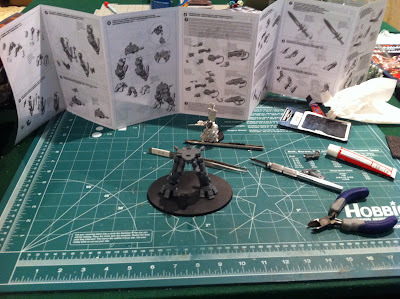 If I’m going to kit-bash and cut up a model, I might as well do it to a cheap one from the internet. I maybe got a little more than I bargained for. The first step was to immerse the Defiler in the wonder of Simple Green. Simple Green is a cleaner that is usually sprayed onto car parts, bike parts, etc. It can degrease and strip off stains. 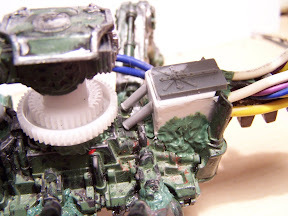 And lots of folks know it’ll yank paint right off models without harming the plastic… well, acrylic paints. 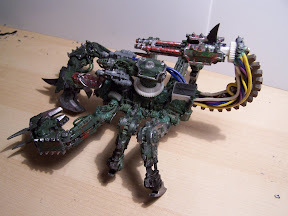 Now, the Defiler I got from ebay is about the ugliest, most poorly-assembled model one could find. Not a big deal, I thought – it’ll be more of a challenge, and modelling challenges are the kind I most enjoy. Yikes. Whatever paint was used on this thing, it’s not responding to Simple Green. Well, I won’t let that stop me. Updates to come! Note: In no way has this incident shaken my faith in Simple Green. It works! Just… not on whatever was used to paint this monstrosity. I finally have the time to update! 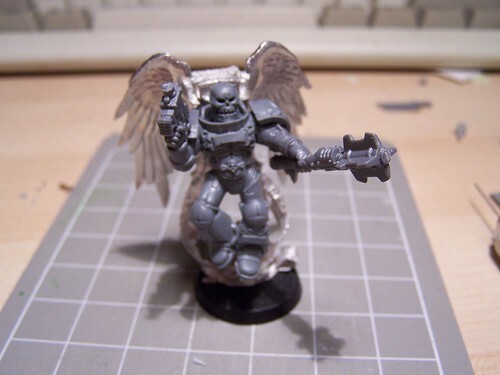 Here are some pictures of a jump pack chaplain I’ve customized for my Space Marine army. 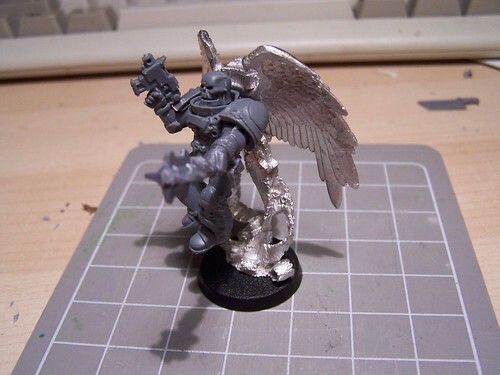 The winged jump pack is from a Blood Angels figure, the helmet is a fantasy Chaos helmet, the mace (I mean Crozius Arcanum) is from the Dark Angels veteran box, the chest and legs are from the Blood Angels Sanguinary Guard. Pretty awesome stuff slapped together to make a pretty awesome chaplain! 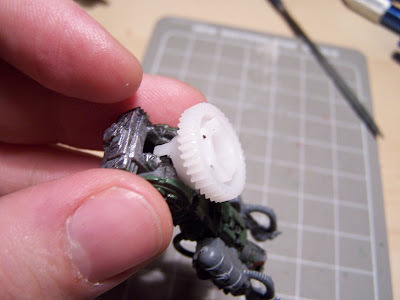 More to come – I’ve got a Defiler conversion and more daemon prince pics on the way.